TAMPA, Fla. -- On Dec. 14, 2010, Joann Gold turned 16. 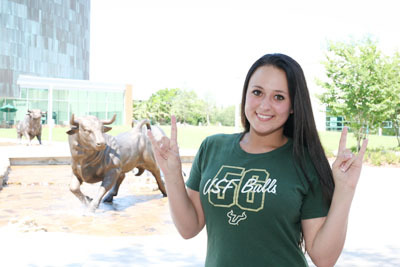 A few weeks later she walked onto USF’s campus as a junior. The past year has been a big one for Gold, who said graduating from high school and receiving h er associate’s degree at the age of 15 are among her greatest accomplishments. It all started when Gold was in 7th grade. She requested to skip 8th grade, but because she was a year younger than the other students, her request was denied. When she took the College Placement Test at the age of 13, she scored on the college level for all sections. It was this discovery that led Gold to pursue dual enrollment at Pasco-Hernando Community College and realize her new found interest in psychology. While in high school, Gold’s daily schedule got her up at 5 a.m. for cheerleading practice and school, and then kept her up until 10 p.m. to take college courses. But she said she does not regret it. Gold’s next challenge was finding a school where she could live on campus. She applied to an out-of-state college, but was told she could not live on campus because of her age. She then applied and was accepted by several Florida universities which would allow her to live on campus. Now nearing the end of her first semester, Gold said she enjoys being on campus. She walks to most places “unless it’s raining or cold.” And while at first her age was not an issue among her peers, over time she has found that it does seem to make an impact. She said she has noticed that most students treat her differently after discovering her age. Gold said since she has been involved in the college environment since she was 13, she doesn’t feel her age should be an issue. She said she has always associated with an older crowd. Gold decided to major in psychology and minor in political science, and after studying abroad in Italy she will be graduating in the summer of 2012 at the age of 17. From there she said she plans on attending law school to learn international business law. In her 16 years, Gold said she has learned some valuable life lessons.